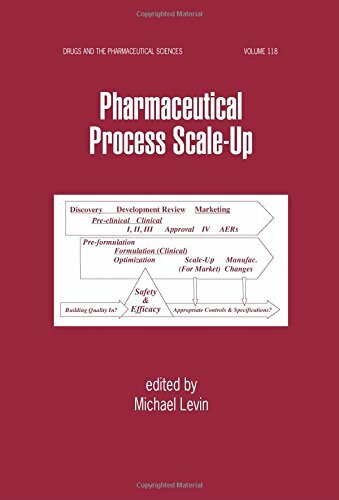 [PDF] Pharmaceutical Process Scale-Up (Drugs and the Pharmaceutical Sciences) | Free eBooks Download - EBOOKEE! Description: Focusing on scientific and practical aspects of process scale-up, this resource details the theory and practice of transferring pharmaceutical processes from laboratory scale to the pilot plant and production scale. It covers parenteral and nonparenterel liquids and semi-solids, products derived from biotechnology, dry blending and powder handling, granulation and drying, fluid bed applications, compaction and tableting, and film coating and regulatory requirements for scale-up and postapproval changes. Drawing on the experience of twenty contributing researchers, the book employs dimensional analysis as a unified scientific approach to quantify similar processes on different scales. No comments for "[PDF] Pharmaceutical Process Scale-Up (Drugs and the Pharmaceutical Sciences)".